New Poll: New low rating for Obama’s performance | can i just finish my waffle? The Rasmussen Reports daily Presidential Tracking Poll for Tuesday shows that 18% of the nation’s voters Strongly Approve of the way that Barack Obama is performing his role as president. Forty percent (40%) Strongly Disapprove, giving Obama a Presidential Approval Index rating of -22. 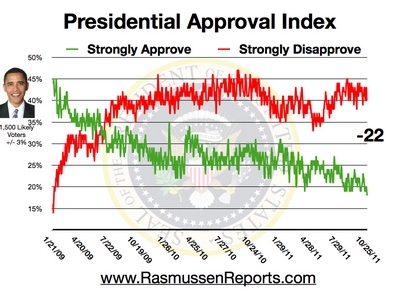 That’s the lowest level of Strong Approval ever measured for this president. Please tell me who you are?? There is no way to find a name on the e-mail.